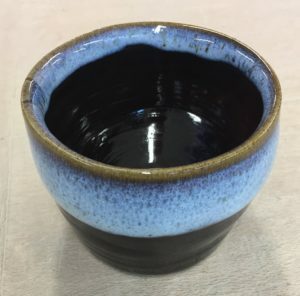 I’ve been studying ceramics for the last two years at evening classes at my local art school. It’s a really fun, social activity and I have made some nice friends doing it (as well as a lot of wonky pots). However, my interest in ceramics goes back a long, long way. I grew up in Boston, Lincolnshire, and one afternoon when I was about 6 years old my dad showed me that if you dug in the ground you didn’t have to go down very deep until you hit a layer of clay, and he dug some up for me and my brother and we made little pots with it. I remember when the pots dried they were really really hard and they didn’t break if you dropped them. 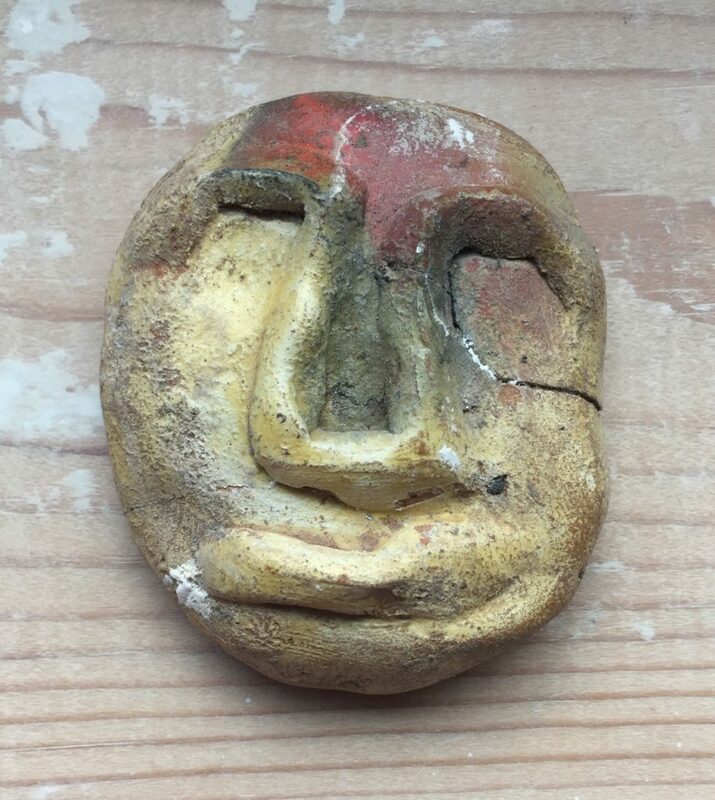 In my late teens I started digging for clay myself, and I started playing about with it. 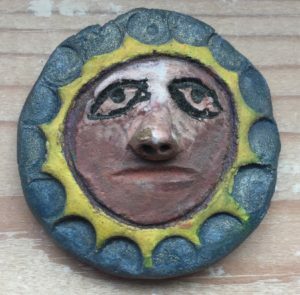 I liked having access to this natural material that I could make things from, although I had no idea how to fire or glaze things (other than putting them in our coal fire and hoping they didn’t get thrown out with the ashes the next day), so I have a lot of artworks from back then which are basically painted mud. I would make little objects and sculptures and then paint them with emulsion or acrylic or even watercolour paints and then varnish them. It was a really lovely, free and expressive thing to do. I wasn’t studying art at school, so this was just a thing I did in my spare time, and it really resonated with something ancient in me. There was this idea that I was doing something that people had actually been doing for a long, long time. I think unconsciously I was channeling things I had seen in books, like ritualistic sculptures made in other parts of the world and by people from a long long time ago, but it did really appeal to me that I could use my fingers to pinch and squeeze and scratch this material from under the ground I lived on and create three dimensional objects that could be painted and decorated and exist as items of expression. 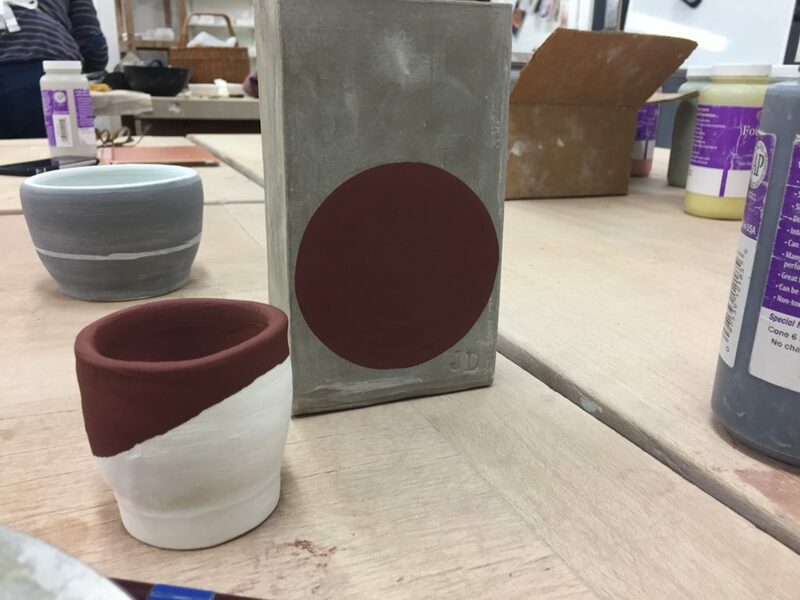 In my evening classes I’ve spent the last two years studying different techniques of both construction and decoration, and I have come to the conclusion that whilst I can create functional items like bowls and vases, they are not my calling. My background is in fine art and I want to work more on pieces that form part of my self-expression. I had a revelation about this earlier in the summer, and so I’m going to be concentrating this term on creating ceramics that form part of other artworks in other media. My hope is to combine ceramic elements with painting and drawing and other media like papier mache and written words. This came about because as part of my technical exploration I have been making a lot of tiles to test out how different glazes and slips can be combined and worked with. I like working with slabs of clay rather than the potter’s wheel; I’ve given the wheel a good go, but there’s something more appealing for me with slabs in the translation of the heart to the hands. I made a number of these test slab tiles and in one example I was trying to decorate it with a continuous line, because with painting with slip for example, you have to keep reloading the brush. 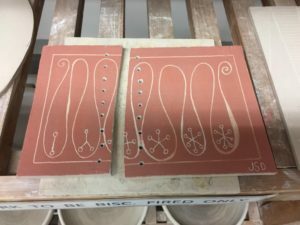 I was experimenting with scratching into dry clay tiles and had worked out something quite satisfying earlier in the summer. But when I glazed it, the detail was all lost under the glaze. 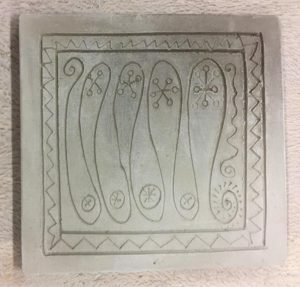 So around about May this year I started a new piece where I would still scratch into a dry clay tile, but this time I would use a layer of coloured slip as a base, so that when that was scratched off the line would have a better chance of showing up through the glaze. 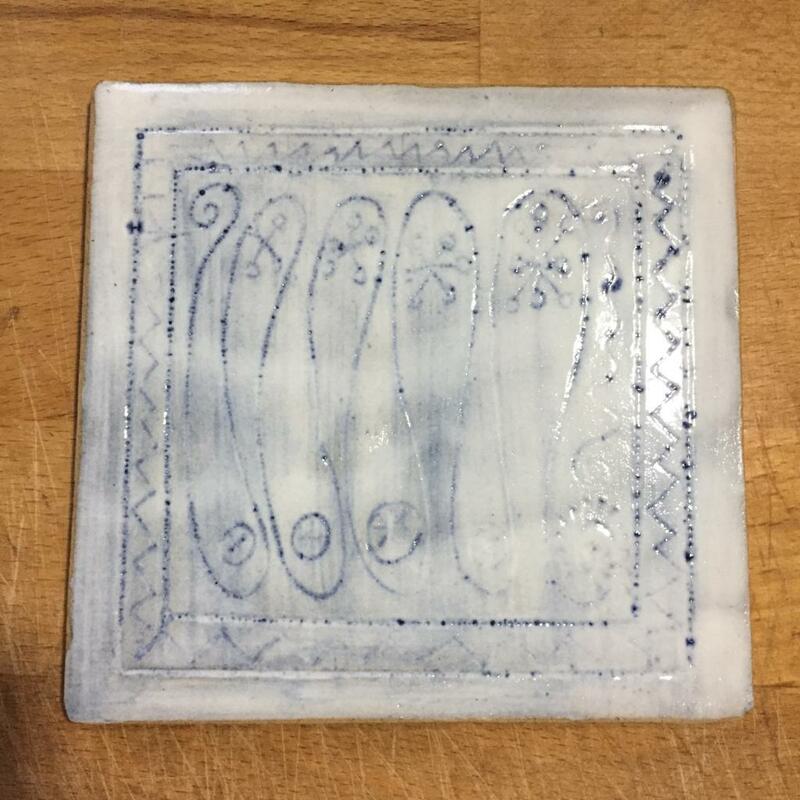 I’m able to take these small slab pieces home in between classes and work on them during the week, and I had got my continuous line scratched into the tile, but when I was transporting it back to college one evening it broke on the way. Some people would have either abandoned the piece, or tried to invisibly fix it, but I realised it suddenly presented an opportunity. 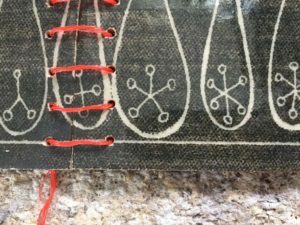 I was going through quite a distressing time back then, and there had been a moment when my emotional dam burst, and this crack leapt out as a symbolic representation of that. 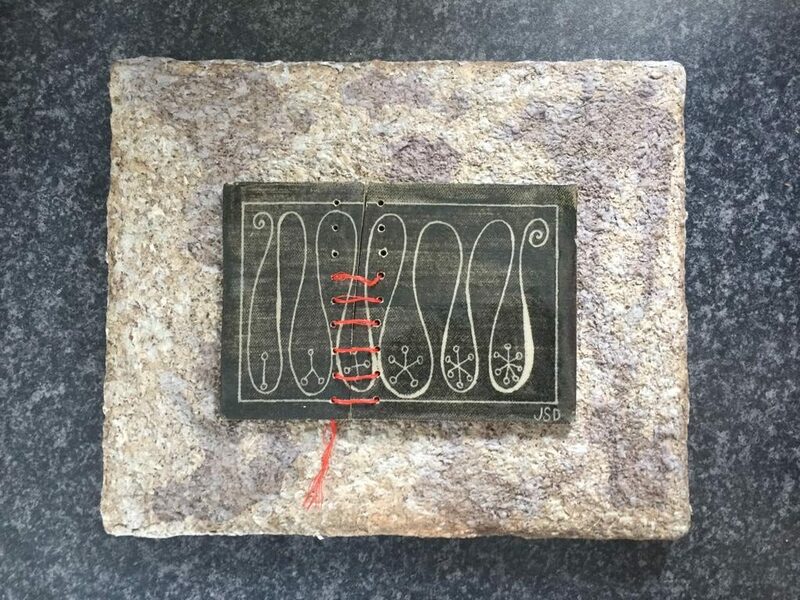 I decided I could stitch it back together with some sort of thread instead of trying to hide the damage, and I made holes in the tile so that when it was glazed and fired I could ritualistically show how the crack had to be lived with and “mended”. I realised that in adding a new material to the ceramic, in the case of the thread, I could also combine both the thread and the ceramic with further media, and I placed the threaded tile on a papier mache panel that I made some years ago (see here for more papier mache work by me). This has been decorated with red wine, which played a part in the story that burst the emotional dam (but which will not be explained any further here). Along with talking with another ceramic artist (who is not part of my ceramics evening class social circle) I realised that self-expression and fine art in ceramics with no functional purpose is a whole unchartered territory for me. I hope to concentrate in this term at least on creating pieces that will become part of new artworks created with other media. Watch this space and see if it works out at all.